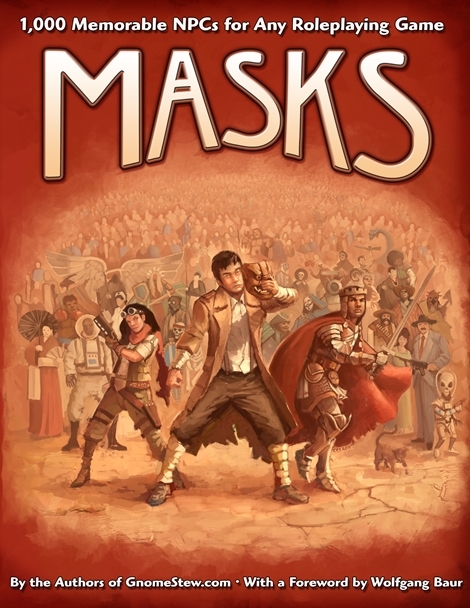 Cover art for Mask: 1,000 Memorable NPCS For Any Roleplaying Game. Credit: Engine Publishing. Like its predecessor, Eureka! 501 Adventure Plots, is designed to be off-the-shelf ready; simply open to a page and run with what you find. The book’s three major sections are each subdivided into Villains, Neutrals, and Allies. Villains and allies are obvious enough constructs — they are there to hinder and help the player characters. Neutrals are more nuanced; they may be board pranksters, exiled nobles, or downtrodden prostitutes; in short they’re characters who could play a variety of roles, from character foil to a throw-away scene encounter to a potential enemy. Each NPC follows the same format: name, short one-line description, pithy quote, followed a narrative stat block that gives his, her, or its appearance, roleplaying notes, personality, motivation, background, and traits. The last of these are keywords — like criminal, royalty, crafter — that quickly sum up the character’s potential. There’s a tremendous amount of material here, and I have to say that the scale of it quickly defeated me. It’s not that the NPCs aren’t well written — I found them to be concise, entertaining, and potentially quite helpful — but as I sat on the sofa with the PDF, sipping coffee and reading entries I couldn’t help but look at the numbers next to each NPCs name. And there are a lot of them. After an hour I was only on 100 of 1000, and frankly my eyes were starting to glaze. Clearly another plan was in order, and thankfully the editors had anticipated my need. I flitted to the back of the book and found what every game master craves: an index. Actually, I found multiple indexes: NPCs by Trait (e.g. abhorrent, beautiful, charming, notorious, occult) NPCs by Name (broken down alphabetically), NPCs by author, and NPC Groups. Of these the first and last were most helpful. “NPCs by Trait” is helpful when brainstorming characters, particularly when you know you need a merchant or scholar, or you know that you want a zealot or an eccentric. “NPC Groups” are pre-packaged collections such as “footpads” or “holy warriors”, or “incompetent wizards” that game masters can leverage to build encounters. The book looks good, but how does it work in the real world? I decided to spend a month using it with my Second Darkness campaign, which is a traditional biweekly RPG using the Pathfinder rules. The campaign quickly provided an opportunity to try out the book. The heroes had just arrived in the town of Crying Leaf, an elven forest settlement on the edge of some drow-infested ruins. They had a week to interact with the camp before launching their attack on the dark elves. The Second Darkness book is light on NPCs in this settlement, so I needed to spin up a few, namely an elven wizard and an elven ranger. The entire scene was to be played out online between real-world sessions. For the wizard I went immediately to the “occult” keyword index and started paging through options. This yielded 48 NPCs I could use. This led me to page 33 and “Ghul-Fan Hraska”, which included a crazed environmentalist. Not what I was looking for, but it got me thinking. The elves are obviously concerned about their environment, so wouldn’t there be a wizard dedicated to analyzing effects of the drow’s foul magic? I quickly sketched up a wizard who the party’s gnome encountered using various alchemical agents and divination spells to analyze plant and animal matter retrieved from the ruins. The next NPC was tougher. I knew I wanted a ranger because the party’s dwarven ranger had decided he wanted to have a game of skills with one of the opposing elves. Here I had a harder time finding something because none of the keywords jumped out at me. What should I use? “Warrior”? “Stealthy”? I jumped around in the PDF looking for something that fit, but as I did so the forum posts stacked up. I knew most of the elves distrusted the party, so I decided to play that up leaving the dwarf with no one interested in taking up his challenge. No one except for a solitary, gruff ranger who disdained his fellow elves rudeness and decided to take pity on the dwarf. That eliminated the need to create the NPCs, so I closed down the PDF. This was a brief experiment, and honestly I’m at the point in my Second Darkness campaign — and my lunchtime Day After Ragnarok campaign — where I don’t need a ton of NPCs. I think that’ll change as both campaigns return to more urban environments, and I can see this book being helpful when I’m suddenly creating a dozen NPCs rather than two. That said, I think I’d prefer the print edition to the PDF. It’s well laid out and easy to ready on the PDF, but I found flitting between the indexes and the individual entries time consuming event when using virtual bookmarks. I think a paper copy, with a real bookmark, would be much easier to browse. That said the book is a good source of inspiration. Like Eureka! a lot of the value in this book lies in inspiration. Sure, it’s great when you can pluck an NPC from its pages and use it as is, but it’s also excellent kindling for igniting your own creative fires.